Expansionary fiscal policy is when the government expands the money supply in the economy. It uses budgetary tools to either increase spending or cut taxes. That provides consumers and businesses with more money to spend. In the United States, Congress must write legislation to create these measures. The president influences the process, but Congress must author and pass the bills. Congress has two types of spending. The first is through the annual discretionary spending bill process. The largest part of discretionary spending is the military budget. Congress can also increase benefits payments in mandatory programs. This is more difficult because it requires a 62-vote majority in the Senate to pass. The largest mandatory programs are Social Security, Medicare, and welfare programs. Sometimes these payments are called transfer payments. They reallocate funds from taxpayers to targeted demographic groups. Congress must also pass legislation when it wants to cut taxes. There are many types of tax cuts. They include taxes on income, capital gains, and dividends. Congress can also cut small businesses, payroll, and corporate taxes. The purpose of expansionary fiscal policy is to boost growth to a healthy economic level. This is needed during the contractionary phase of the business cycle. The government wants to reduce unemployment, increase consumer demand, and avoid a recession. If a recession has already occurred, then it seeks to end the recession and prevent a depression. Tax cuts also occur during the expansionary phase of the business cycle. A presidential candidate may promise it during a campaign. By the time he fulfills his promise, the recession may be over. Expansionary fiscal policy puts more money into consumers' hands to give them more purchasing power. It uses subsidies, transfer payments including welfare programs, and income tax cuts. It reduces unemployment by contracting public works or hiring new government workers. All these measures increase demand. That spurs consumer spending, which drives almost 70 percent of the economy. The other three components of gross domestic product are government spending, net exports, and business investment. Corporate tax cuts put more money into businesses' hands. They use it for new investment and employees. In that way, tax cuts create jobs. But if the company already has enough cash, it may use the cut to buy back stocks or purchase new companies. The theory of supply-side economics recommends lowering corporate taxes instead of income taxes. That gives companies funds to hire more workers. It advocates lower capital gains taxes to increase business investment. But the the Laffer Curve states that this type of trickle- down economics only works if tax rates are already 50 percent or higher. The Trump administration used expansionary policy with the Tax Cuts and Jobs Act. He's also increased discretionary spending, especially for defense. Military spending increased to a record $885 billion. The Obama administration used expansionary policy with the Economic Stimulus Act. The American Recovery and Reinvestment Act cut taxes, extended unemployment benefits, and funded public works projects. In 2010, Obama continued many of these benefits with the Obama tax cuts. He also increased defense spending. All this occurred while tax receipts dropped, thanks to the 2008 financial crisis. That's why the national debt increased so much under Obama. 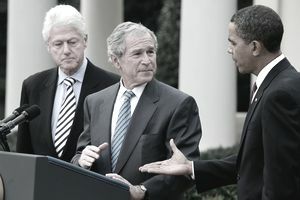 The Bush administration used expansive fiscal policy to end the 2001 recession. It cut income taxes with the Economic Growth and Tax Relief Reconciliation Act, which mailed out tax rebates. But the 9/11 terrorist attacks sent the economy back into a downturn. Bush launched the War on Terror. He cut business taxes in 2003 with the Jobs and Growth Tax Relief Reconciliation Act. By 2004, the economy was in good shape, with unemployment at just 5.4 percent. But Bush continued expansionary policy by starting the War in Iraq. President John F. Kennedy used expansionary policy to stimulate the economy out of the 1960 recession. He promised to sustain the policy until the recession was over, regardless of the impact on the debt. President Franklin D. Roosevelt used expansionary policy to end the Great Depression. At first, it worked. But then FDR reduced New Deal spending to keep the budget balanced. That allowed the Depression to reappear in 1932. Roosevelt returned to expansionary fiscal policy to gear up for World War II. That massive spending finally ended the Depression. Expansionary fiscal policy works fast if done correctly. For example, government spending should be directed toward hiring workers. That immediately creates jobs and lowers unemployment. Tax cuts can put money into the hands of consumers if the government can send out rebate checks right away. The fastest method is to expand unemployment compensation. The unemployed are most likely to spend every dollar they get. On the other hand, those in higher income brackets are more likely to use tax cuts to save or invest. That doesn't boost the economy. Most important, expansionary fiscal policy restores consumer and business confidence. They believe the government will take necessary steps to end the recession. That's critical for them to start spending again. Without confidence in that leadership, everyone would stuff their money under a mattress. Tax cuts decrease government revenue. That creates a budget deficit that's added to the debt. The tax cuts must be reversed when the economy recovers to pay down the debt. Otherwise, it grows to unsustainable levels. But, reversing tax cuts is often an unpopular political move. The U.S. federal government has no limitation because it prints money. It can pay for the deficit by issuing new Treasury bills, notes, and bonds. As a result, the national debt is $66 trillion. That's more than the country produces in a year. When the debt-to-GDP ratio is more than 100 percent, investors get worried. They buy fewer bonds, sending interest rates higher. It can slow economic growth. Politicians often use expansionary fiscal policy for reasons other than its real purpose. For example, they might cut taxes to become more popular with voters before an election. That's dangerous because it creates asset bubbles. When the bubble bursts, you get a downturn. It's called the boom and bust cycle. Expansionary policy is used more often than its opposite, contractionary fiscal policy. Voters like both tax cuts and more benefits. As a result, politicians that use expansionary policy get re-elected. State and local governments in the United States have balanced budget laws. They cannot spend more than they receive in taxes. That's a good discipline, but it also reduces lawmakers' ability to boost economic growth in a recession. If they don't have a surplus on hand, they have to cut spending when tax revenues are lower. In this scenario, cutting spending worsens the recession. Expansionary monetary policy is when a nation's central bank increases the money supply. Monetary policy works faster than fiscal policy. The Federal Reserve can quickly vote to raise or lower the fed funds rates at its regular Federal Open Market Committee meetings. It may take about six months for the effect to percolate throughout the economy. The Fed can also implement contractionary monetary policy to raise rates and prevent inflation.